See your art come to life dot by dot and piece by piece. Use our new line of self adhesive crafting plastic sheets and shapes with our Clearly Mosaics™ pieces and stones to create your own masterpieces. 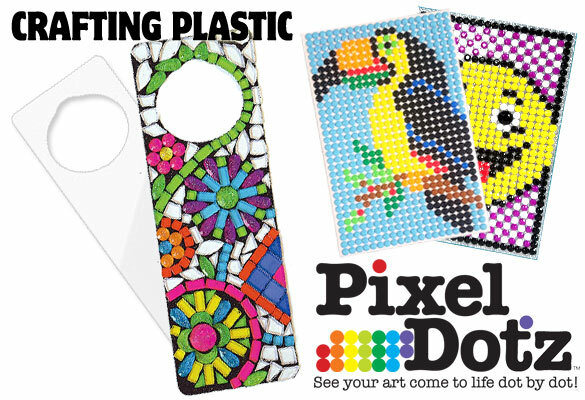 We also have a full line of Pixel Dotz™ kits available that include everything you need to get started. You will get crafting plastic, stones, an applicator tool, full color pattern and instructions. Our new line of organizer boxes is made of durable polypropylene to protect all of your items. The boxes feature hinged lids that either snap closed or have latches to secure even your smallest components. Most models also include movable dividers that allow you to customize the compartment layout for your needs. Welcome to our online craft supply store. We currently sell a mixture of some of our most popular beads and those hard to find craft beads that people have been asking for. We also have a variety of WonderLoom® products, Holiday Celebration™ ornament kits, bead boxes, beaded banners and craft and jewelry kits. Be sure to check back often to see what has been added and sign up for our news letter to get updates on new items and specials. You have asked and we have listened. We have started adding our Beaded Banner kits to the online store. We can't possibly put our entire library of designs online, but the first batch is stocked and ready to ship. Periodically we will be adding new or rotating different designs through the store, so if you like Beaded Banners, keep checking back. It’s always Christmas at The Beadery® Craft Products! Make your own seasonal decorations using our Holiday Celebration™ craft kits. Each kit contains everything you will need to make your ornaments, including high quality beads, Ornapiks™, findings, wire, chenille and fully illustrated, easy to follow instructions. Not only are we the manufacturer of the WonderLoom® family of bracelet makers, but we also have a complete line of accessories for you to personalize your creations. There are colorful band refills in mixes or single color bags, extra c-clips and WonderLoom® Bead Boxes full of beads and accessories that you can use in your creations. Click below to see more details on all of the WonderLoom® products. The Beadery® Craft Products - The Most Creative on the Market! We have been manufacturing plastic beads and other parts for crafts, jewelry, toys, and industrial applications in Rhode Island since 1932. Whether it was under the name Synthetic Moulding Products, Greene Plastics Corp., The Beadery® or Buick, llc, we have always delivered trend setting styles and quality that have lead the market. In the past eight decades, our company has grown tremendously, and is a world leader in plastic beads, acrylic rhinestones, cabochons, acrylic mirrors, decorative flower and leaf beads, pony beads – the list is endless! Check out our product lines to see what we currently have available. Our value packs of Pop Tabs™ are now available for sale on the web store. Each value pack includes 150 pieces of our plastic Pop Tabs in our five best selling color mixes. Check out the Pop Tab™ page for more information on what they are and how to use them.